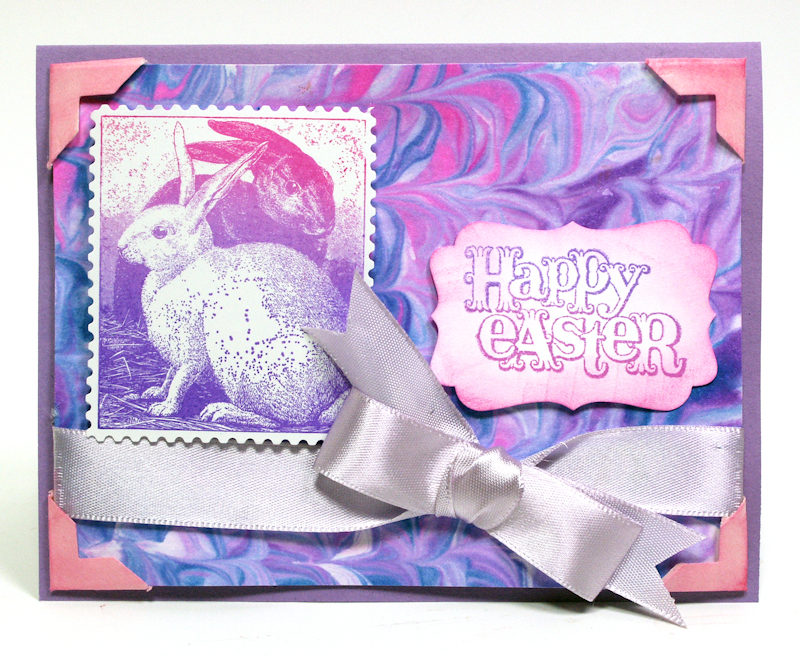 Happy Easter & Tips for detailed stamps! 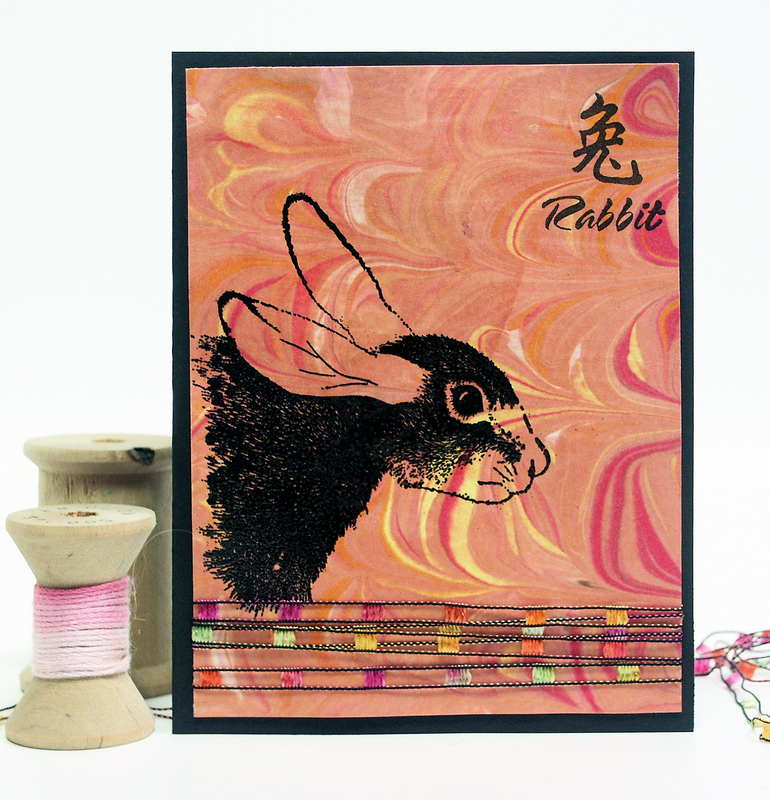 OK, so on to the stamping tip, when you are using a very detailed stamp like this rabbit stamp by Magenta use a rubber brayer to apply ink to the stamp. It will prevent gobs and puddles of ink in the tiny detailed dots of a photo-realistic stamp. 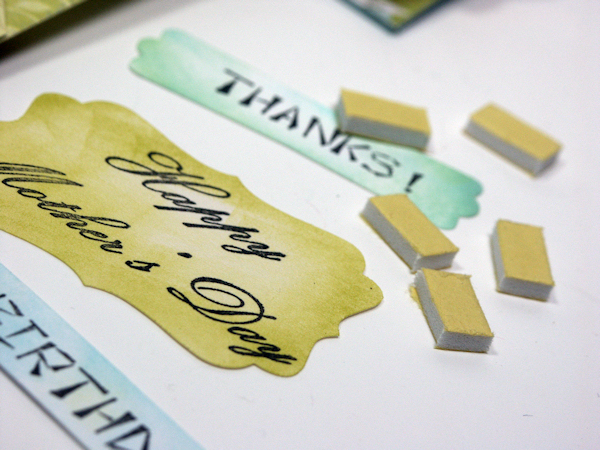 also use glossy paper (photo paper will work) because it will capture the detail perfectly. 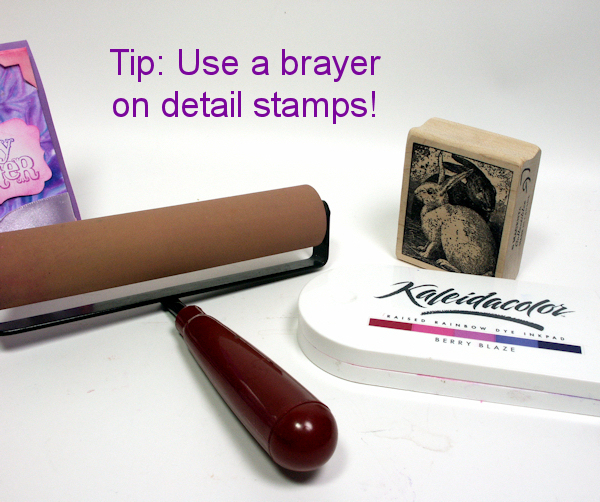 I like to lay the stamp rubber side up on my table, ink it with the brayer and press the paper to the stamp. Give it a try! Thanks for stopping by, happy Easter and til next time happy crafting! Fun huh? 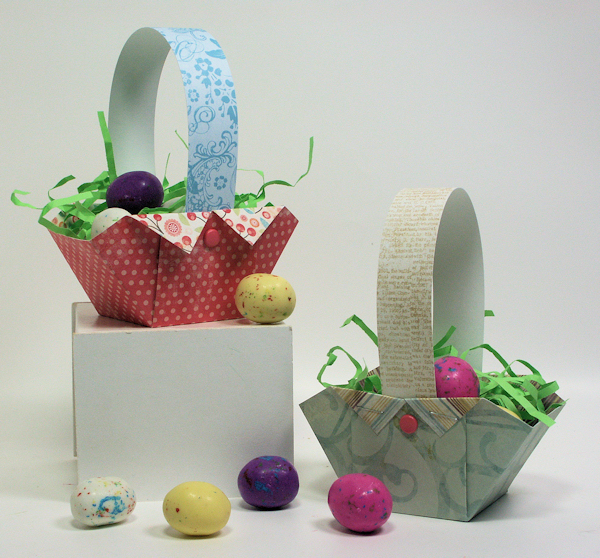 I think these would be cute with some crayons inside perched atop a paper place-mat to entertain little ones waiting for Easter dinner! Thanks for stopping by and til next time happy crafting! 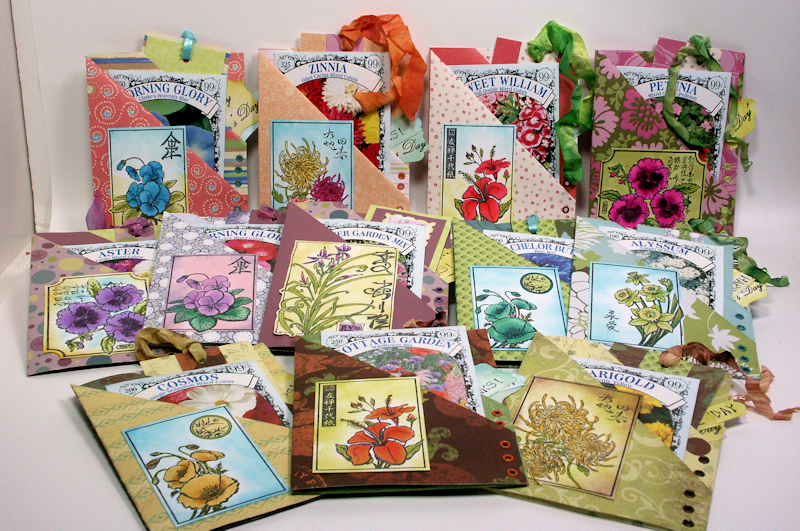 I started with cotton drawstring bags from Papermart. 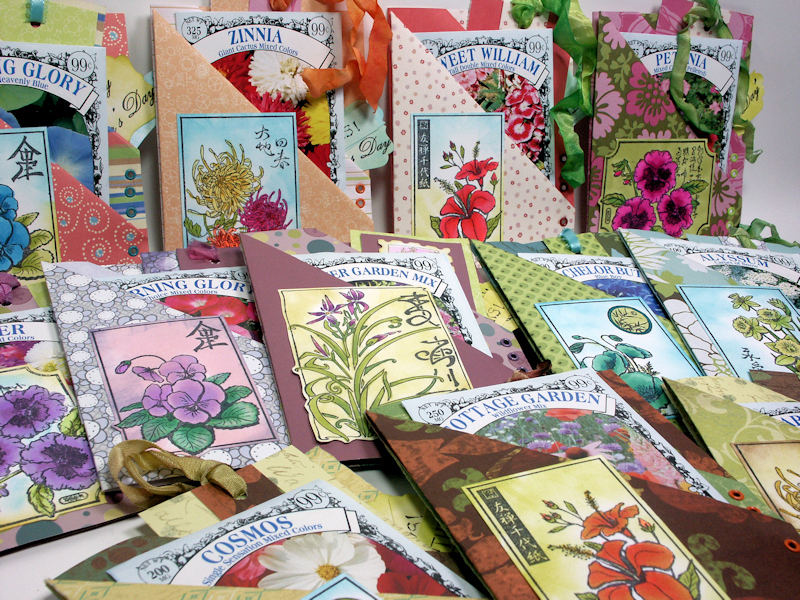 I used the 5″x6″ size and they were 39 cents each (you can’t make them that cheap!) 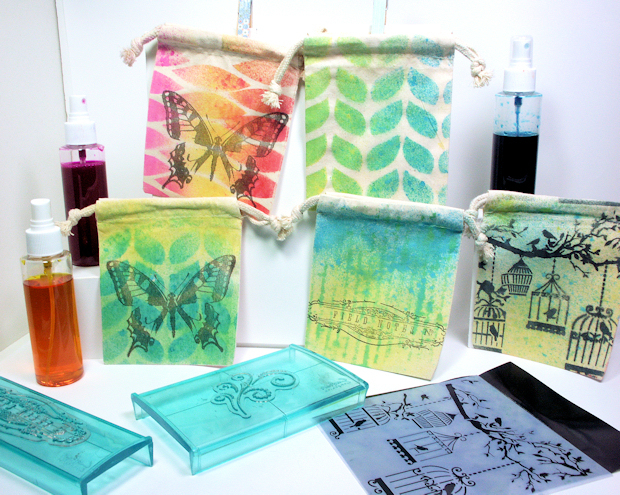 Then I used my newly made spray inks, clear stamps and pigment ink to decorate them. Watch the video to see how! Easy huh? Another idea is that you can personalize a gift bag. Kids love stuff with their names on them and if you have an unusual name (like Lindsay, at least in the 80’s when I was a kid) it is hard to find personalized products. Well, you can grab your letter stamps and make a bag that had anybody’s name on it, neat! Thanks for stopping by and til next time happy crafting! 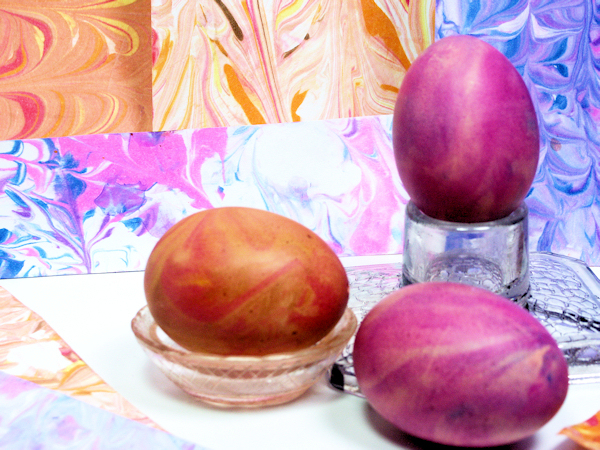 Video Tutorial: How to Marbleize Paper & Eggs! Here is a fun project you will want to try today. It is quick, easy and inexpensive and what’s more, your kids will love it too! I’ll warn you it’s a bit messy (that’s what it’s so darn fun) but the results are stunning. Check out this Easter card I sent my sister, I made the background paper. I stamped the rabbit (About Art Accents) with black pigment ink and heat embossed so it would stand out on the marbleized paper. Looks fancy and store-bought right? Nope, I marbleized it with shaving cream! Watch this quick video to see how, I’ll even show you how to use this technique with eggs! 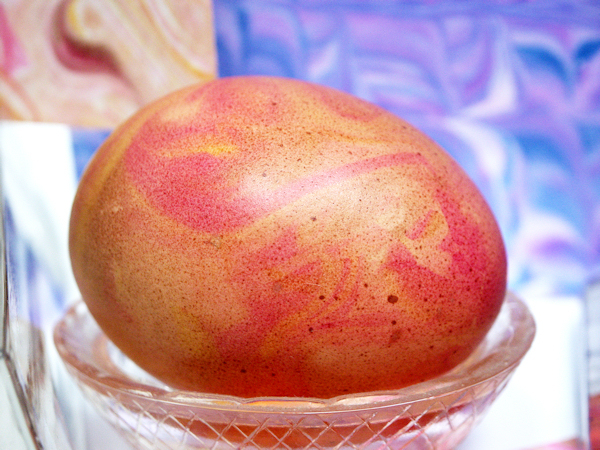 (swap out the liquid watercolor for food coloring) but I worry the shaving cream might give the eggs a soapy taste. After you blow out and clean the eggs you need to dry them. Microwave them 30 seconds ( for a dozen) , then dip them in vinegar and nuke them again for 30 seconds. The vinegar locks the color! I hope you try this today! It is a great outdoor project to do with the kids to and you can just hose everything off when you are done! Thanks for stopping by and til next time happy crafting! 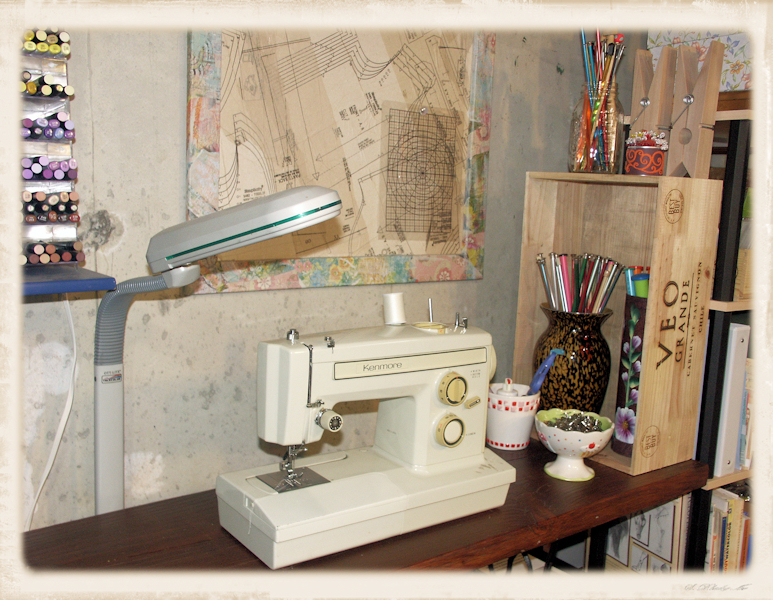 WOYWW: A Winner & A Sewing Nook! And yes, I made the poncho! OK so I know a lot of you are tuning in to see who won the stamp set from About Art Accents, well… drum-roll please…..
Congratulations! I will email you for your contact details so check your spam folder if you have not received an email from me yet;) Thanks to all who played along. 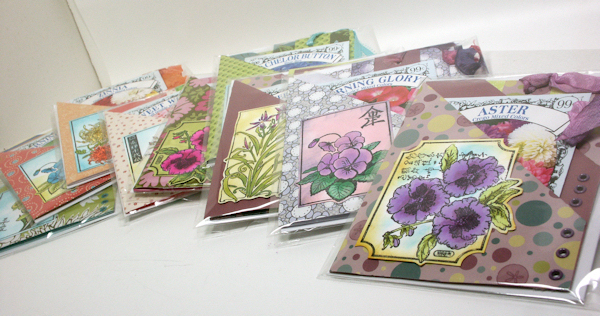 After making that first card last week I decided to make a dozen and use one of my favorite About Art Accents stamp sets: Flowered ATC Trading Cards, it is great for those who like to color with alcohol ink markers because the detail is amazing, and it is on sale for $16.99 (regular $29) each stamp is 2.25″x3.25″, that’s a lot of rubber! I plan to sell them at the spring fair I am vending at next month. I thought they would be great for Mother’s Day but I did not want to limit my customer base so in each card package I include a Happy Birthday Thanks and Happy Mother’s Day sentiment and 2 foam squares for sticking them on. That way there are 3 occasions the cards can be used for. I am selling them for $3. I think they look nice and tidy in their clear envelopes! Well that’s all for today. I hope I inspired you to cram more junk…er, I mean look for alternative storage space in your craft space! If you want to check out more crafty desks visit Julia’s blog and til next time happy crafting! Spring is here and that means babies! Here are the supplies I used: Plastic Baby Clothespins in white ($1.20 a dozen), Baker’s Twine in light orange, Large Ric-Rac trim in white (dyed with spray inks), a Shipping Tag, kraft and white cardstock, a scrap of green paper, watercolor paper, watercolor pencils (I prefer Inktense) a sponge dauber and scalloped punch (or you can cut a circle with scalloped scissors.) Watch this video to see how I made this! 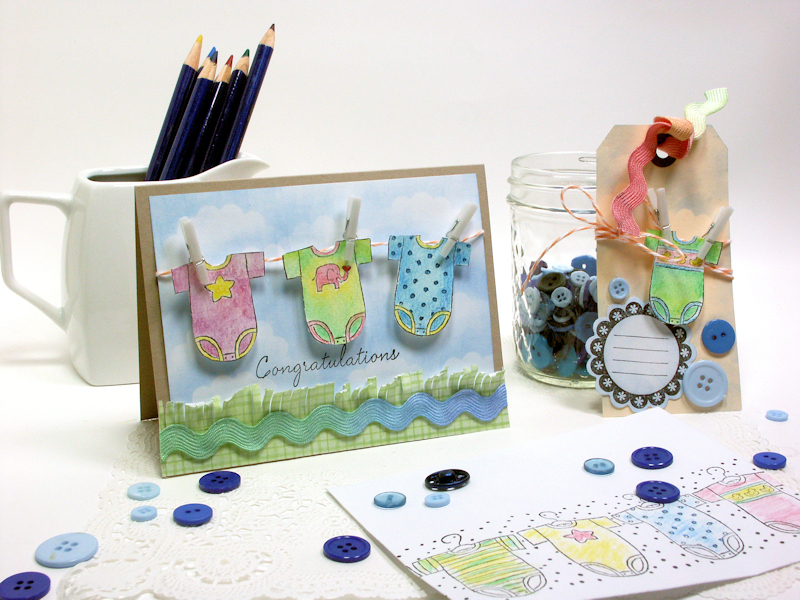 Variations: Look at the stamps you have, you could stamp bibs, diapers, tiny tee’s and socks and other baby stuff! 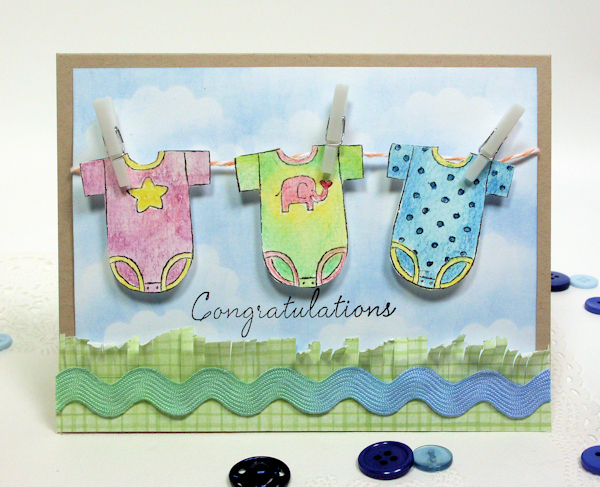 Or you could stamp some swimsuits for a “Bon Voyage” card. Have fun with this design. Thanks for stopping by and til next time happy crafting! Today I want to share a project that my daughter Lila designed. 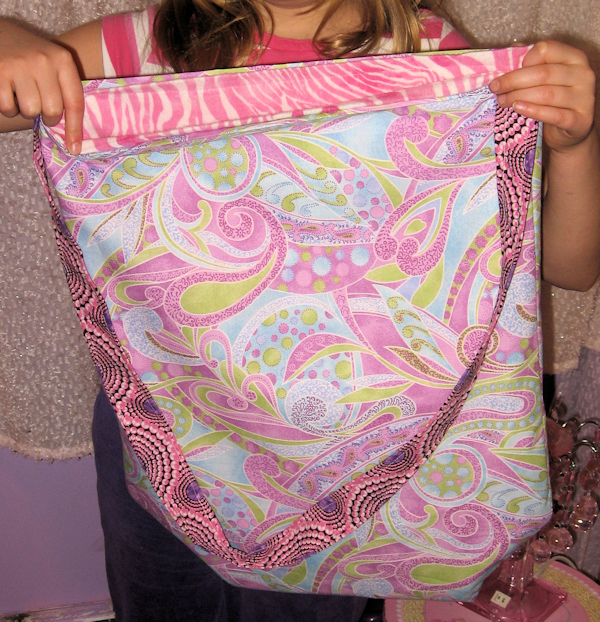 She wanted to make a reversible bag with a rounded bottom. When it was done it reminded me of the bag paperboys used to carry to deliver papers on their bikes. We went shopping for fabric and had the bag made in an afternoon. 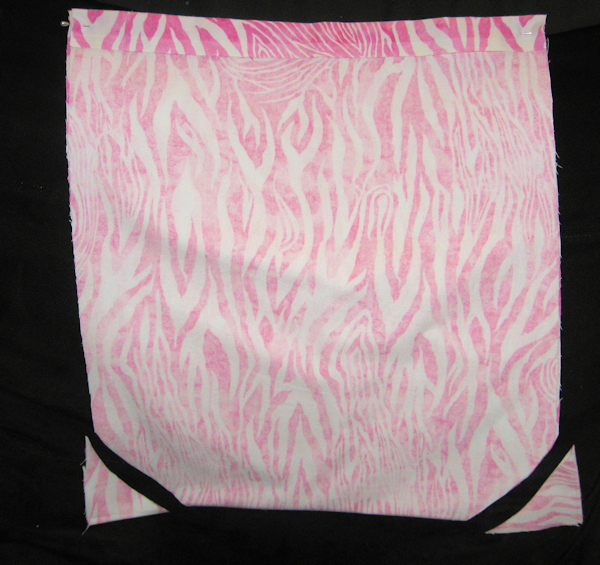 You will need: 1/2 yard for the outside of the bag, 1/2 yard for the inside and 1/4 yard for a strap. 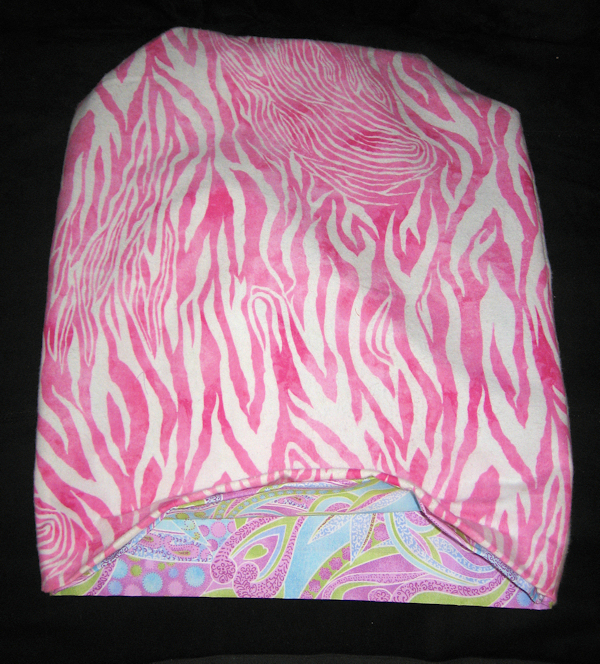 I used 45″ wide cotton. As you can see the project rang up to about $5, not bad eh? This is a no waste project (although you might need to trim your fabric a bit if the person who cut it at the store was sloppy.) Step 1: Press 1″ down on each finished edge of the fabric. 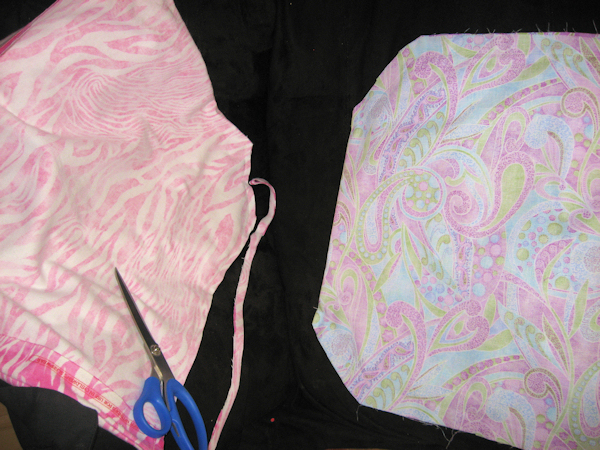 Fold the fabric in half right sides together (matching up the pressed edge) and press. Trim one of the bottom corners off at an angle and use the scrap as a template the trim the other side. 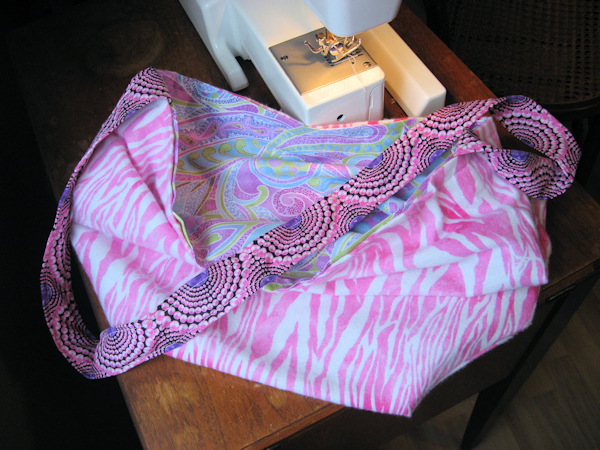 Sew up the sides with a 1″ seam allowance. 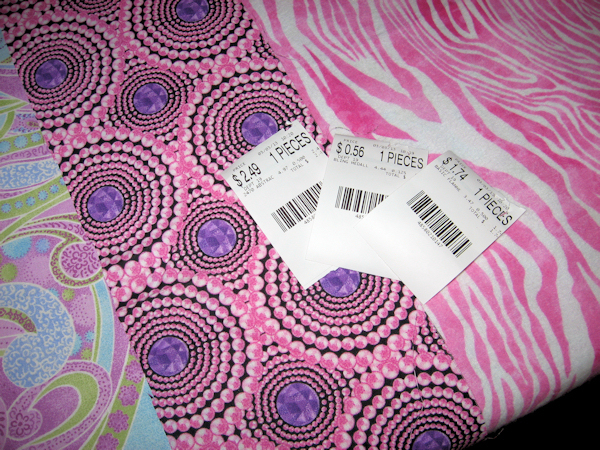 Repeat for other 1/2 yard of fabric. Step 2. Trim the seams to 1/2″. This will make the bag lass bulky. Now you have two bags, here they are shown right-side out. Hold them together and see if one is a bit smaller, if so, take the smaller one and turn it inside out and place it inside the other bag lining them up at the seams. Pin the bags together. You should be able to see the right sides of both fabrics with no raw edges. Step 3. Make the strap! 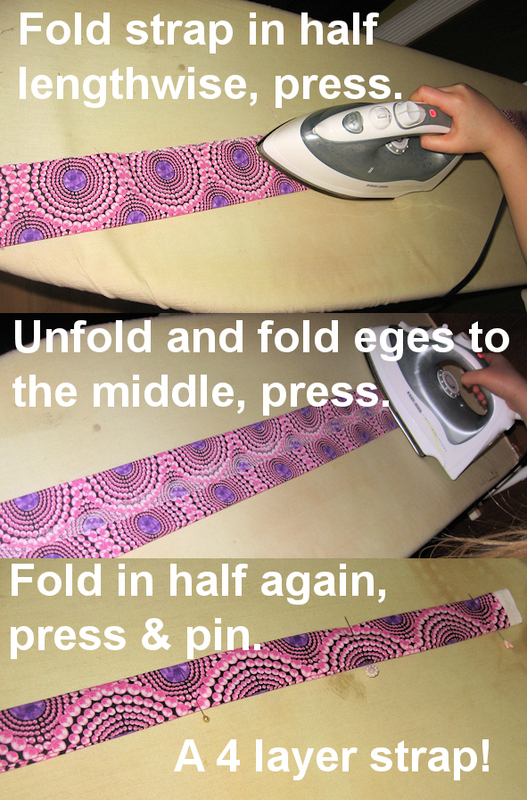 Follow the instructions in the photos for pressing, then stitch down the edges. Step 4. Pin the strap to the bag by sandwiching it in between the two bag layers. If you want a shorter strap you can sink it in there farther or trim it first. This will give us an elegant invisible join! Step 5. Stitch along the edge of the bag being as neat as you can. You will have your bag and strap sewn together in one pass! 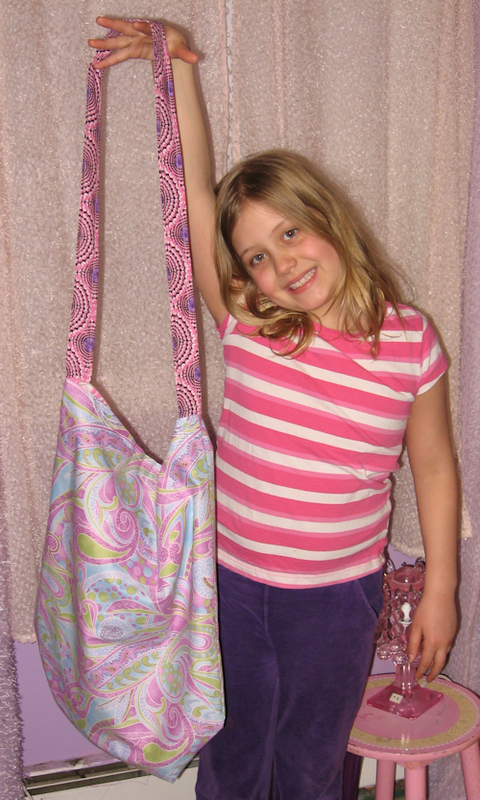 There you have it, a finished reversible bag with no waste. 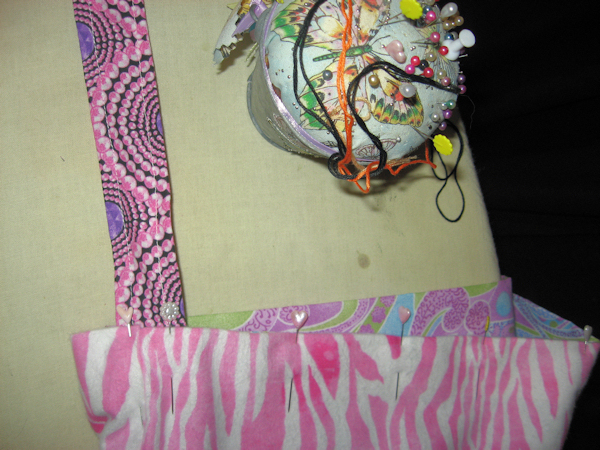 You can start off with different size fabric and make any side bag this way. My daughter was so pleased with the results!